Imagine a world where there is not one but two species of human. The Reds are humans as we know them in every reguard, whereas the Silvers are practically gods. They have silver blood and epic powers. As is natural in a world like this, the Reds are oppressed and a rebel group is rising red as the dawn (sorry I couldn’t help myself). 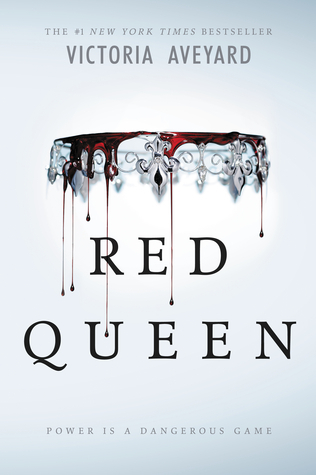 The books I’m talking about is Red Queen by Victoria Aveyard. This books has been quite controversial amongst people I know. One of my best friends loved it, and I trust her judgement. However while carrying it around I was approached by two other friends who hated it with a passion and another friend who didn’t particularly enjoy it. I have to say I’m in the later category. There is a reason for the discrimination. I really don’t like how in most dystopian novels one group of people appoints themselves as above all the others for bascically no reason. At least here there is one. The main character is a good mix of special and clever. Mare Barrow, the main character in this novel, may suffer from a case of ‘chosen-one-itis’ for most of the book but she does maintain a skill set that isn’t too out of the ordinary. She doesn’t pick up fighting super quickly, nor do manners and learning come easy to her. ***SPOILER*** (highlight the space to see) Mare Barrow’s case of ‘chosen-one-itis’ is revoked near the end of the novel due to the discovery that other people also have powers. This is a good save. The rebellion group is clever. Sure they may also be endangering everyone, but at least they are taking action… right? Nonetheless they have their stuff together, and a well organised rebellion is something I can get behind. The love triangle. Seriously… Mare goes back and forth between Cal and Marven more times than I speak to other people in a day. I found this so annoying to read. It wasn’t too badly done though, I was able to see why she liked each of them and there were good and bad moments with each. I have to say that as love triangles go this one wasn’t too bad except for how reliant the plot was on it. Character development. Despite this being a world full of people, most of the characters seemed two dimensional. There was the rude mean girl, the clever scholarly type, the stubborn childhood friend. And that’s only the ones that were given a personality. There are so many characters mentioned or who show up for a chapter or two then are never seen again. Couldn’t they have been made important to the plot somehow? Or at least developed past a name and appearance. The stereotypes. The whole book felt… new but at the same time old. There were a few clever plot twists but most of the set up and plot felt recycled from a dystopian novel despite this being a fantasy. I did like how there was no ‘after the apocalypse’ type thing. This world stood on its own. Over all I did enjoy Red Queen. The premise was interesting and it was easy to read. I do plan on reading the sequel. I think I was swayed by some of my friend’s harsh opinions to scrutinise the book more than I otherwise would have. I rate it a three out of five. I still recommend reading this book, especially if you enjoyed the love triangle in The Selection by Kiera Cass or the court aesthetic in The Final Empire by Brandon Sanderson (my review here). I felt just about the same way, I liked it, but there are some things that were just ‘eh’. Great review!